BETTY Cuthbert, the original Aussie Golden Girl and who took the 1956 Melbourne Olympics by storm as an 18-year-old, has died aged 79 after a long battle with multiple sclerosis. 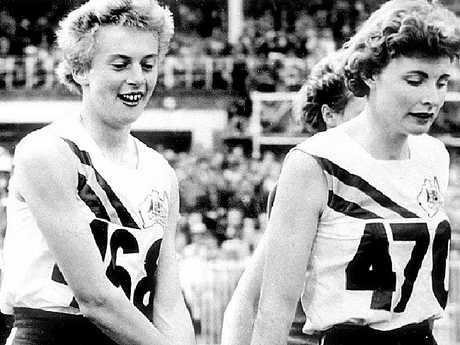 WATCH: 18-year-old Betty Cuthbert's gold-medal winning 100m race at Melbourne 1956. Cuthbert was Australia's first inductee into the IAAF Hall of Fame in the inaugural year in 2012, along with Jesse Owens, Carl Lewis and others. Betty Cuthbert with Aussie relay teammate Marlene Mathews. She failed to defend the titles at the 1960 Games in Rome due to injury. But she returned to the Olympics four years later after a two-year break from the sport, winning a fourth gold medal and becoming the first athlete in the world to do so in four different events. 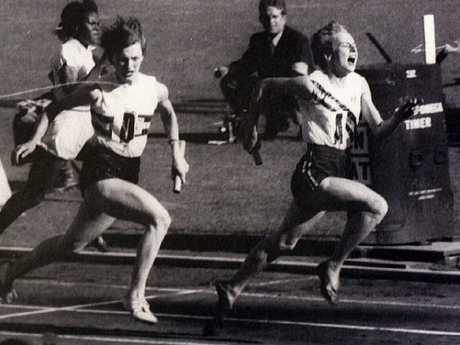 Betty Cuthbert holds off the Brits to lead the Aussies to gold in 1956. Athletics Australia, where Cuthbert is also a Hall of Fame member, confirmed her death on Monday. The Sport Australia Hall of Fame, of which Cuthbert is a member, also offered their condolences. "Betty was a true inspiration and role model to all Australians," chairman John Bertrand said. "Her feats on the track brought together Australians as one. She loved the country and we loved her". Cuthbert was born in Sydney in 1938, a twin to sister Marie. A wheelchair-bound Cuthbert, who learned she had multiple sclerosis in 1969, was part of the torch relay at the opening ceremony of the Sydney Olympics in 2000.